Lagos – History has been made in the quest for health workers’ career progression as the Lagos State Government has approved the creation of Consultant Pharmacist cadre in its scheme of service. In a letter of appreciation to Mr. Akinwunmi Ambode, Lagos State governor, Pharm. Bola Adeniran, Chairman, Pharmaceutical Society of Nigeria (PSN) Lagos State chapter, thanked the Lagos State Government for the gesture. Pharm. Adeniran said that the creation of the consultant cadre was a testament to the global best practices expected of a Centre of Excellence like Lagos. She said the creation would eventually ensure that the professionals would be able to practice to the best of their ability in enhancing patient-centred healthcare services. “We look forward to the speedy implementation of the circular,” she said. The creation of the consultant cadre for pharmacists was sequel to the approval of the submission of the Association of Hospital and Administrative Pharmacists of Nigeria (AHAPN) made to the Head of the Civil Service of the Federation on May 8, 2017 on the need to review the Scheme of Service for Public/Civil Service Pharmacists. The letter of approval was signed by Dr. A. K. Muhammad, Permanent Secretary (SPSO) for Head of the Civil Service of the Federation. In the submission, the AHAPN contended that the current Scheme of Service had no provision for the Fellowship programme of the West African Postgraduate College of Pharmacists (FPCPharm). “Under the extant scheme, Pharmacists are stagnated at Grade Level 16 or even 15 because there is only one provision for Grade Level 17 which is the directorship position. It is important to state that a good number of Pharmacists spend over 12 years on Grade Level 16 with many of them retiring without the attainment of Grade Level 17. “Therefore the request for review has been necessitated by the fact of the establishment of the West African Postgraduate College of Pharmacists to acquire more skills through specialist courses which they undertake in a four year programme thus qualifying as consultants. The AHAPN also said that public service pharmacists had been engaged in manufacturing and quality assurance of pharmaceutical products used in public hospitals both at State and Federal levels thus helping in improving the quality of products and services rendered by pharmacists in public health institutions and the increasing role of Pharmacists involvement in policy formulation on drug use, distribution, control and management. The submission was submitted in 2008 during the National Council on Establishment meeting held in Jos, Plateau State following which the NCE set up a technical committee which went round to verify the claims in the submission. The team visited Lagos, Enugu, Plateau and Kano states after which it submitted its report to the Prof. Oladipo Afolabi, the then HoCSF. The Committee headed by the Head of Service of Benue State was mandated to harmonise the submission and make recommendations to a larger council. The council sitting in Abuja in Agust 2011 approved the submission. The Council upheld the recommendation of the Committee and approved the request for the creation of Pharmacists Consultants Cadre in the Public Service and the Scheme of Service for the Cadre. In the new scheme of service, Consultant Pharmacist would be on GL 15; Principal Consultant Pharmacist GL 16 while the Chief Consultant Pharmacist would be on GL 17. Recall that JOHESU is currently on nationwide strike over alleged Federal Government’s failure to meet their demands. The union suspended its last nationwide strike on September 30, 2017, after signing a Memorandum of Terms of Settlement (MOTS), with the Federal Government. The MOTS was supposed to be implemented within five weeks after the date of suspension of the strike. However, the union noted that six months after the suspension of the nationwide strike, government was yet to do anything tangible over the pending issues. 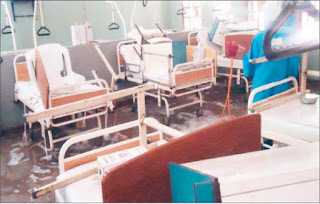 However, the striking Joint Health Sector Workers (JOHESU) last Wednesday, directed all its members in states and local governments to join the in a nationwide indefinite industrial action beginning today’s midnight. The directive was announced by Comrade Biobelemonye Joy Josiah, the National President of the union, at a press conference in Abuja. According to him, the directive was sequel to another deadlocked meeting between JOHESU and the federal government delegation led by the Minister of Labour and Productivity, Chris Ngige. Earlier, the strike was limited to the tertiary health institutions, but Biobelemonye said JOHESU had decided to involve its members at both State and LGAs levels following government unresponsiveness to their demands. He blamed the government for not showing any seriousness to meet the demands of the union for adjustment of the CONHESS salary structure which affects over 95 per cent of the health workforce nationwide. The National President said: “The Government has not shown enough commitment to tow the path of honour and meet our demands, especially, the core demand for the upward adjustment of CONHESS Salary Structure as agreed in the Memorandum of Terms of Settlement signed on September 30, 2017 with JOHESU. Biobelemonye further alleged that members of JOHESU have continued to be shortchanged by the Federal Government in favour of medical doctors. He added, “On the issue of CONHESS adjustment, which we regard as the flagship of our demands, government in 2014 granted CONMESS adjustment to Medical Doctors and immediately two months arrears while other months were spread. “CONHESS review is the upward adjustment of the CONHESS Salary table in-line with the same principles used in adjusting the CONMESS table for Medical Doctors who work with us in the health team. “Our own demand for the adjustment of CONHESS that affects over 95 per cent of the health workforce nationwide has been frustrated, and part of the reason for this is that the Minister of Health as well as the Minister of State for Health are all Medical Doctors, while the Minister of Labour and Employment, who should be a neutral umpire in Trade Disputes is equally a Medical Doctor. “However, after three rounds of meetings held on Thursday, April 26, 2018, May 2, 2018, and May 7, 2018 respectively, at the instance of the Minister of Labour and Employment to find a way forward, but alas, the Federal Ministry of Health is bent on thwarting all efforts at reaching an amicable settlement of the issues of our demands. “This is particularly concerns the upward adjustment of CONHESS Salary Structure. “Despite the superior argument of National Salaries, Incomes and Wages Commission to the effect that basic salaries are always the same apart from the 1991 distortion which was later corrected by a Federal Government policy with the Harmonised Salary Structure of 1988, while relativity is based on the entry point of Doctors and other Health Professionals,” he stressed. “Government has not shown any seriousness to meet our demands and the existence of fifth columnists in and out of government who are bent on escalation to prolong the strike for their selfish interest of privatisation of government hospitals, and buy these government legacies for themselves has not helped the matter,” he added. JOHESU commended their members who despite all provocations and intimidation have stood firm to defend their right. The union further appealed to the general public and Nigerians to bear with it for the withdrawal of their services, which can be attributed to the insincerity of government, particularly, the Federal Ministry of Health. It accused the leadership of the Federal Ministry of Health for behaving like a ‘Federal Ministry of Doctors’ rather than a Federal Ministry of Health. However, due to various appeals and intervention from well-meaning Nigerians and Opinion Leaders, JOHESU said, it has decided to temporarily put on hold other activities such as; street protest/processions; rallies at state capitals, and joint zonal picketing. Under the then President, His Excellency Alhaji Umaru Musa Yar’Adua, the Nigerian Government in 2009 had approved two different Salary Structures in the Health Sector. These two Salary Scales were known as Consolidated Medical Salary Scale (CONMESS) and Consolidated Health Salary Scale (CONHESS).Medical Doctors in the Service of the Nigerian Civil Service are on CONMESS, while every other person working in the Health Sector was placed under the CONHESS structure.